FEBRUARY 22 from 5pm – 8pm and FEBRUARY 23 from 11am – 2pm. THIS ITEM MUST NOW BE PURCHASED THE DAY(S) OF THE EVENT. We do have tickets available even though it says “Out of Stock” below. HERE’S HOW IT WORKS: You purchase an EMPTY Chocolate Walk box from Main Street Mount Joy. This special box will contain information about the Chocolate Walk with locations where you can either taste chocolate items or get a piece of chocolate to put into your box. You can visit each location once, and the location will check off your box so you know where you have been and where you still need to go. Only persons with the MSMJ Chocolate Walk box will be allowed to sample chocolate or receive chocolate items. 1 box per person for the chocolate sample and/or item. If you are touring with 2 people and both want the chocolate sample and/or item, you must purchase 2 boxes. 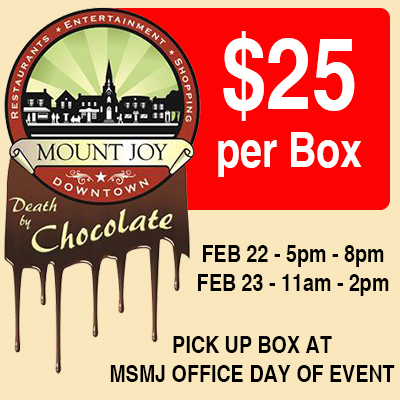 Boxes will be picked up at the Main Street Mount Joy office on either day. Bring your receipt as proof of purchase. We will check your name off and give the box to you. There will also be wine tasting available to the public – no ticket necessary. YOU MUST BRING ID (no matter your age). BRING A FOOD DONATION TO THE MOUNT JOY FOOD BANK!